Howe Turkey Farm in Downingtown raises turkeys on an all-vegetarian diet and without the use of hormones or antibiotics. Read all about this local turkey farm and their farming practices in our interview with them! 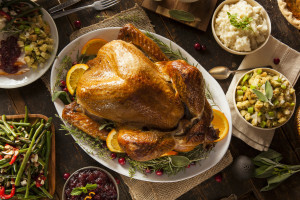 For Thanksgiving, choose 10-24, 30+ lbs for whole turkeys and 4-15+ lb. bone-in portions for turkey breasts. They will be ready for pick-up the Saturday, Monday, Tuesday and Wednesday before Thanksgiving. Turkey breasts (bone-in) – $7.99/lb. Please call us at 610-856-7300 to check availability (turkeys are still available but not at all weights).